This piece of Rowdyruff Boys and Powerpuff Girls, known in my headcanon as the superhero team Team Xtreme, is dedicated to a fellow DeviantArtist by the name of Rolando Cuevas aka ROCuevas who celebrated his birthday yesterday. So, Rolando, I hope you had a wonderful birthday and I wish you well in everything you do as an artist. Sit back, relax, and enjoy this piece of Powerpuff Girls fanart. 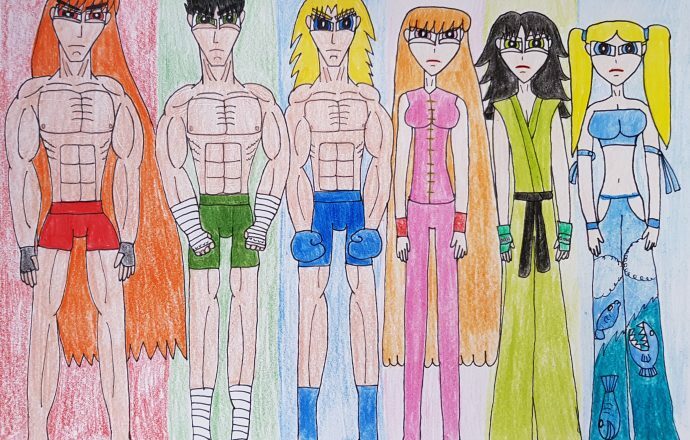 Ladies and gentlemen, I present to you all the members of Team Xtreme in different martial arts attire. From left to right, we have the following. Moreover, as you can tell from the expressions in their eyes, the pairings are Brickercup (Brick x Buttercup), Blossutch (Butch x Blossom), and Boomubbles (Boomer x Bubbles). So, in turn, I dedicate this Team Xtreme martial arts pic to all of the shippers of Brickercup, Blossutch, and Boomubbles. 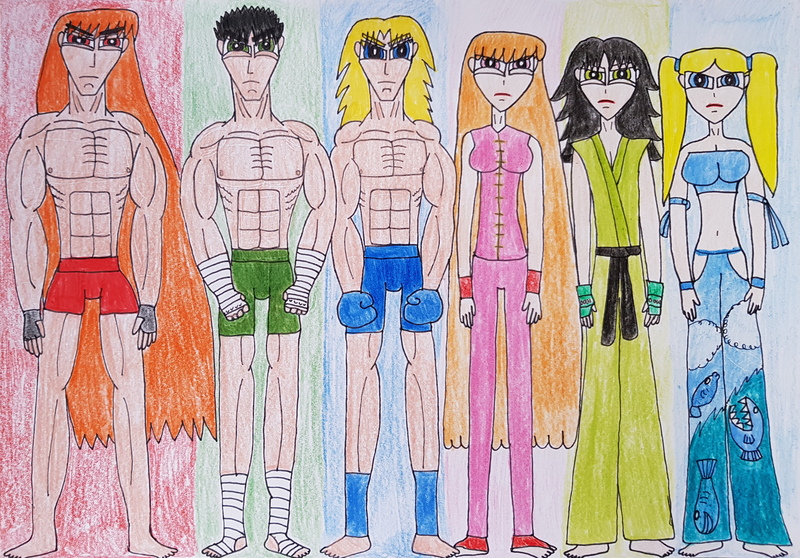 In my headcanon, Team Xtreme as well as their closest allies and friends Mitch “The Persecutor” Mitchelson, Bunny “The Bouncing Mountain” Utonium-Mitchelson, Harry Pitt, Julie Bean-Pitt, Mike Believe, Robin Snyder-Believe among others practice different types of martial arts including karate, judo, jeet kune do, boxing, taekwondo, Muay Thai, kickboxing, wrestling, mixed martial arts, and jujutsu both Brazilian and Japanese. So when making this picture involving the main Team Xtreme members I had to consider which martial art could complement them in terms of personality, interest, and overall plausibility. For what I got, I definitely enjoyed getting to know the different martial arts and researching about each of them to make them gel these superheroes and to some extent their fighting styles. For Brick, I chose Pankration because this martial art is not only a precursor to mixed martial arts but also has its roots in Ancient Greek history. Since Brick is both street smart and book smart, he would have a great understanding of where Pankration came from as well as the many moves and techniques being used. Thus, he would be able to learn about the history of this Ancient Greek martial art. Moreover, Pankration is considered to be a deadly martial art where it involves combining wrestling and boxing. One can easily imagine Brick not only knowing all the moves by heart but also using it rather effectively in both sparrings and in real-life battles. So, for someone like Brick, strength, smarts, and instinct certainly make him for what he is as a fighter. Butch is an obvious choice for Muay Thai given how warlike, animalistic, and brutal he can be both in his personality and in his fighting style. He is the type of person who fights to live and his life is usually a constant battlefield, where physical and mental strength is an absolute must in order to win. The fact that Muay Thai fighters hit banana trees with their shins in order for them to be strengthened and be rock-hard is actually a phenomenal tidbit that sparked my interest. One can highly doubt that Townsville has any banana trees. So, the Townsville version would have Butch hitting oak trees or any strong tree or any strong material with his shins. Moreover, Butch seems to be a fighter who values close-contact fights, thus applying clinches, elbow strikes, and knee strikes to his opponents. Sure, wrestling could have been a choice for Butch, but I think Muay Thai fits him to a T.
In Boomer’s case, I didn’t solely end up with boxing but also kickboxing, given how fast he is with his hands and feet. Boomer seems to be the type of fighter who combines strength and speed and does so in a way in which he can incapacitate his opponents rather effectively. One can easily imagine Boomer delivering different types of punches and kicks from hooks to jabs to uppercuts to roundhouse kicks to crane kicks. Moreover, I can easily imagine him to not just be a very strong fighter who uses muscle but also rapid speed thus making him a force to be reckoned with. Blossom and Shaolin Kung Fu really do go hand-in-hand. On the surface, this has something to do with Blossom’s experience with the Chinese language and even the Chinese culture. So someone who is immersed in Chinese culture as Blossom would also know the two types of Kung Fu namely Shaolin and Wing Chun. Shaolin Kung Fu is definitely up Blossom’s alley because of the monk-like self-discipline, diligence, and warrior’s mindset she bears to live up to this particular style of Kung Fu. Moreover, as a fan of the episode Stuck Up, Up and Away, the way Blossom managed to attack Princess Morbucks is not just elements used in Shaolin Kung Fu but also in Wing Chun Kung Fu, given how close-contact it is. At least, that’s what I presume it to be. Let’s also not forget that scientific studies show that a Shaolin monk’s skull and bones are a lot stronger than those of normal people due to the training they do. So, that principle would definitely apply to Blossom. I went for Kyokushin Karate for Buttercup, as she is someone who applies full-contact attacks on her opponents. Let us also not forget that Kyokushin Karate is very different from Traditional Karate, given that Kyokushin is full-contact but avoids the punching of the face something that Buttercup does to her opponents. Yes, by saying this, Buttercup should have been more fit for MMA, but my headcanon side stated that everyone from Team Xtreme as well as Mitch, Bunny, Harry, and many other of their allies and friends practice MMA. So, with Buttercup, Kyokushin Karate actually ended up being a nice fit for her. Let’s also not forget her experience with the old monk from Makes Zen to Me. I’m fully aware that the old monk practices Shaolin Kung Fu and not Kyokushin Karate, but the variety of attacks Buttercup has as well as her experience of being more self-disciplined with her temper and allowing herself not to cave into unnecessary animosity certainly make her complete as a fighter. Capoeira was the ultra crystal-clear choice for Bubbles. For someone who is graceful as her, this particular martial art fits her to a T. And of course, her outfit does make one think about Tekken’s Christie Monteiro another Capoeira partitioner. Knowing Bubbles who can make fighting an art she would definitely combine elements of dance, music, and acrobatics to enhance the overall accuracy of her attacks and not just doing it for the sake of putting up a show. When all is said and done, Bubbles would definitely be the fighter who uses her combat prowess and artistic to create something brilliant and would, therefore, leave her opponents taken aback. Well, there you have it. If I were to have added Mitch and Bunny on here, their martial arts would definitely be MMA and judo respectively. Maybe I will explain it all in another submission. I hope you all enjoyed this post and picture because I put a lot of thought and research into this and I ended up having a few choice sources that made me compelled to make this happen. Metatron’s Top Ten Most Effective Martial Arts is an absolutely recommendable view. These may be his opinions, but he manages to heighten my interest in all of these martial arts. Thanks so much for taking the time to have a gander at this and have a great summer.